It occurs to me, a number of weeks past the fact, that Shavuot has already become a distant memory — hard to place. Can’t even remember what I did yesterday, often, let alone however many weeks ago. I don’t remember when, exactly, but I do remember why I didn’t post right away — Shavuot marked my first baking failure — a vegan cheesecake that came out as something more like a tofu almond flan cookie tort. First I shied away from posting because the meaning of dairy during Shavuot confused me — it seemed to me that the more I read, the less I understood about the relationship between dairy and the holiday, and then I shied away further when my vegan cheesecake came out of the oven, looking nothing like any cheesecake I had ever seen. I presumed my first attempt at cheesecake (never have I even tried to make the cream cheese kind!) would yield some delicious concoction of creamy goodness and sugar. In preparation, I went out and bought an electric hand mixer and a springform pan. Then I walked a few miles to another store; there I wandered up and down grocery store aisles comparing the costs of potential ingredients. I didn’t do enough basic research to design my recipe beforehand. I took on too much, fretting over prices, and what seemed like big decisions regarding the degree to which I could “cop out.” There’s pre-made vegan sour cream and vegan cream cheese that is chemically designed by someone else already to have the consistency, taste, and after taste of the “real thing.” But, of course, I settled on the significantly cheaper and potentially more exciting extra firm silken tofu and decided to take the formation of the recipe into my hands. I grabbed tofu and egg replacer, looking up a few vegan cheesecake recipes on my smartphone, and deciding to take the cheapest and more “authentically vegan” ingredients from each and mixing them myself with my own proportions. I figured the ingredients would speak to me when I got home, present an order themselves, almost. Some great ideas came to me, I set them aside for after the revelation I knew I’d experience pulling a delicious cheesecake from the oven, and so I filled my cart, checked out, and I revved up for a long weekend of baking. I stayed up late, I got up early. And here is what I made (or what made me). It wasn’t bad. People ate it. They didn’t throw it up. It was sweet, didn’t taste like the tofu that was, basically, its entirety. Still I stared at it, like a face off. And I stared at it for easily a week before I even attempted to try a piece. And it wasn’t bad then. (Another point for vegan foods!) But, you know, Shavuot is an interesting, if undercelebrated, Jewish holiday. And in retrospect, it all makes sense to me — how this turned out, and how I approached my second vegan remake. It’s an age-old story, really. Shavuot literally translates as “Weeks” — marking the weeks between Passover and receiving the Torah at Mt. Sinai. Being myself, I decided to draw a little journey map here, as part of the meditative process in deciding what it means to count the omer. 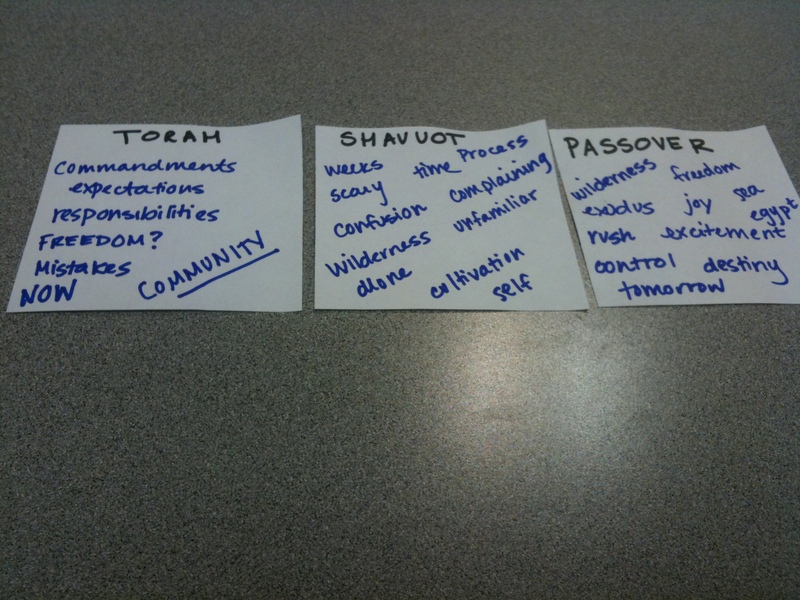 Nothing I was reading about Shavuot was satiating me. So what? Counting what? Huh? And why dairy? And when I did read something that tried to explain, I thought, what ABOUT the “land of milk and honey?” Because that’s strikingly un-vegan, though, being Jewish, and holding so many truths in one hand, the Torah is still overwhelmingly for veganism. The fact of the matter was — I just had yet to crack the code. It seems to me Shavuot in the culmination of change that has occurred throughout the Passover journey — out from Egypt, through the Red Sea, across the desert, through the wildness of time, and into nationhood. It also seems to me that it is really a bigger deal than I have been exposed to thus far in my Jewish journey, or that I came across on the Interwebs. On this day, after weeks of dutifully regarding and nurturing oneself and one’s actions, we commemorate the great journey through the darkness and confusion of freedom; we commemorate, perhaps, the great journey of all, the discovery of self, through successes and, obvs, through the failures. Over the course of this time, the Jews in the desert fought and grappled with themselves and each other, broke boundaries, evaded responsibility, begged for more — and when it became hard there in the middle of the proverbial nowhere, just outside the promised land, they lost hope, purpose — and they longed for the chains of their past So did I, approaching Shavuot. I spent a lot of time thinking I should have simply bought the vegan cream cheese, ready made to taste like cheesecake; I should have followed a recipe more closely; I should have tried to make a dairy cheesecake first. Or I should have tried blintzes. I should have that, should have this. I looked at the product of my efforts and turned up my nose because it wasn’t good enough. I griped a lot. It was my first failure. I had felt a great freedom starting the blog, but when it came time to solidify a routine for myself, to churn out these recipes, delicious and innovative, I came to a giant unknown, I bit off more than I could chew, and I stopped believing I could keep going in baking much of anything, and certainly not a cheesecake without the CHEESE. I like to think we were all there at Mt. Sinai, that we all received the Torah — or, if not that, we all receive and re-receive the Torah, every year, between Passover and Shavuot because we are commanded to count the omer, to prepare. The weeks that have passed since I baked that flan/tort/cookie concoction seem to have given me the time I need to understand the responsibility I have to myself, with my baking and this blog, to keep going. It’s unrealistic to imagine I will leave a safe, easy space into a new way of life without bumps along the way — it takes time to understand the responsibility needed to create the habits of one’s new life. Pushing through that wilderness, we can enter a land flowing with milk and honey — a land where life is sustained. It takes time to learn how to live this new life, but let’s just be realistic about it — the cake is just starting to show — the whole first year is icing (or flan). Only with this in place, steady, comfortable, can we begin to branch out. And, perhaps weeks late, we will understand that things aren’t necessarily what they seem. The land of milk and honey is a great land, a land that is flowing with goodness, an ecosystem that is sustaining, where greed, pride, and control over output aren’t a threat. (Hyperlink above explains the role of bees in our ecosystem — highly recommend a looksy). In the meantime, chugging along, trying to gather the experience needed, I took a stab at Angela Liddon’s already very deliciously vegan Apple Streusel Cake In A Jar and adapted these delicious looking non-vegan cardamom cookies (simply replacing the eggs with flaxseed eggs) while I was at it. These are some recipes that inspire me to keep going, and are delicious enough to pass on. I hope you enjoy them! So — to my first failure — finally — happy hello! And, ya know, um, happy goodbye — until the next one. No more false presumption that this new life will be so free and easy. Nope, no, it definitely won’t be, but rewarding it definitely will be.